Deer Park 205 is located on the second floor of this condominium building. Winter on the back deck of Deer Park 205. Winter view of the river from the deck of Deer Park 205. A lovely two-bedroom, two-bath second floor condominium in Deer Park Resort. This condominium sleeps four guests comfortably with a king bed in the master bedroom and two twins in the second bedroom. The master bedroom also offers a flat screen TV with DVD while the second bedroom offers a TV with built-in VCR. In the living area build a fire in the wood burning fireplace and relax watching your favorite DVD in front of the 42" Flat Screen TV. While here make sure to enjoy the sounds of the river and the wonderful view from the back deck. Enjoy Deer Park's Indoor Pool and Fitness Club as well as access to the man-made private pond with sandy beach. As always its the best place to stay. Clean, homey, quiet. Its like being home but better. Love the area and look forward for our return visit. We have stayed at Deer Park for many years and haven't found the right unit to want to go back to each year. This one has been the best place so far. Well stocked kitchen and spacious roooms. very relaxing and so much to do around the area and on site at Deer park. lake was gorgeous and having the river to view and walk behind us was a dream. Planning an weekend getaway for 20 family members is no easy task but this resort and rental agency had it easy. A beautiful well appointed unit and family friendly property made it a wonderful and relaxing time for our family ranging in age let from 4 months through 70 years. We had a great weekend in this beautiful condo. So comfortable, everything you need. Clean, comfy beds. Would definitely rent this condo again. We went to the ice castle. So much fun. Thank you for sharing your beautiful home. Lovely unit with comfortable amenities. Easy check in even on Christmas Eve. Accommodating office staff. I mentioned we prefer to sleep on two pillows and the staff had extra pillows in the unit. We stayed at Deer Park and have for the last 3 years. The facility is like being home. Well equipped and clean. The deck is a nice touch for morning tea or coffee with the river just below. I love this peaceful setting and in the evening it helps you to relax. Very good condo, well-equipped, great view of river with good balcony furniture. We have stayed here several times and always enjoy it. And Loon Res. Service is excellent to work with. We had a great time being snowed in at this property. The highlight was definitely the wood burning fireplace (with firewood stacked conveniently right outside the door). I imagine the view off the deck is lovely in warmer weather as well. The unit was a bit dated (master suite and furnishings) but was extremely clean and comfortable for our family. The kids loved the pool and we loved the idea of the skating rink but it was snowed in most of the time we were there. Understandably the focus was on keeping the roads and pathways clear, which they did a great job with. We did not utilize the ski shuttle but we won't make that mistake again - parking at Loon was extremely challenging! Overall a great trip; we will visit again! Very nice and clean condo. Close to all attractions and skiing. Perfect for a family of 4. Kitchen well equipped so we made many of our meals. Clubhouse pool great for laps. A great thanksgiving weekend getaway. I have stayed here at 205 deer park many times and I am always happy with the condition of the house, the reservation department , and the resort itself. I always speak highly of this home to my friends and family. I will definitely be coming back again. Going to try to come up in the summer for there is so much to do here. Looking forward to coming back soon for more rest and relaxation. the facility was so beautiful and the area very quiet so you can rest well. We spent everyday on the mountain was just great. this is the third year to stay at this location. we love it. This was my 20th time using Loon Reservation Service and the 5th time in this unit. I dont keep coming back because the experience is bad. The unit is always clean and well appointed. Anytime that i have an issue ( such as no wifi), Loon was quick to resolve the problem. I always recommend Loon Reservation Service to my friends and i intend to visit again. The home was beautiful, clean, and quiet. This is our second time staying here and we loved every minute. It is well stocked for kitchen use, which is unheard of in other condos. I love it our favorite place to stay. 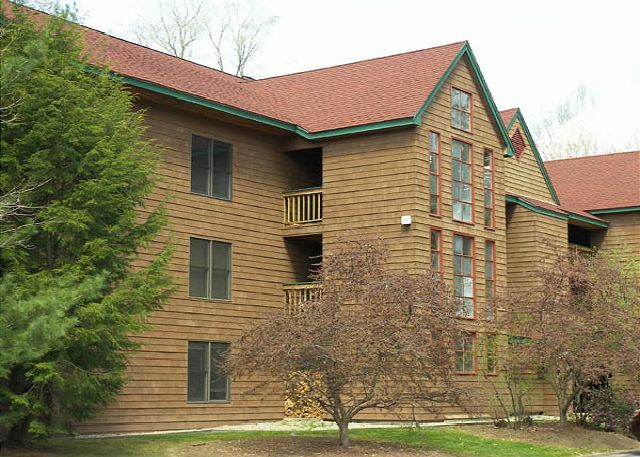 Rented Deer Park Unit 205 for two mid-week nights. Had a great time. This was our second time staying at this location. We love the location and the unit itself, and hope to rent for years to come. This was our third visit to this condo. Beautiful location, overlooking the river. The condo has all the amenities you need and is always very clean upon arrival. Great location in location, close to many of the attractions we visit each year. Look forward to our next visit. Outstanding, great rental and well appointed. we have stayed at over 10 units and this ranks near the top. This is always a favorite spot. Glad that you enjoyed it so much! the most beautiful place yet that we have stayed at..cozy and quiet..the only thing i did not like was the smoky smell from fire place we did not use it i have asthema so fires are out of the question but beautiful and fully stocked..i would stay there again in a heartbeat..
We (family of three, including a 5-year-old) had a really fantastic time staying at Deer Park 205 in August 2014. The location was ideal; the condo itself is comfortable, sizable and even quite luxurious; there's a nice pool and small beach/lake onsite; and it's close to a lot of good hiking, bike trails, mountains, activities. First-rate, all the way. This was our second time staying in this condo. Both visits were quite enjoyable. The unit is extremely clean and is equipped with everything needed as a home away from home. The beds are comfortable, the deck overlooking the river is relaxing, and kids love the pool! This has become our favorite place to stay in the White Mountains. We'll definitely be back again! Great to read - we look forward to having you back! The house was comfortable and charming. The pool was conveniently located and a big hit with our kids. A couple of light bulbs burned out while staying there. We replaced one (over the dinner table), but could not unscrew the light fixture in the kitchen to change that bulb, and I forgot to mention it upon leaving. The kitchen was fairly dark as a result. Thanks for mentioning it now. One never knows when that will happen, but please call us during your stay nextt ime, and we'd be glad to take care of that for you. We're glad that you enjoyed your stay and the kids enjoyed the pool! Very much enjoyed this condo; we had been here before a few years ago, and it is still in very good shape. Love the view of the river and the outside deck. That is a beautiful spot! Glad that you enjoyed it again! The unit was spotless and comfortable.The property was beautiful with a lake and brook outside our condo.The area has alot to do even for young adults with plenty of restaurants etc.The scenery is spectacular.There is hiking,boating,bike riding etc. We were very satisfied with the cleanliness and amenities at the condo at Deer Park, and would recommend both the Loon Reservation Service and the condo at Deer Park. Thank You for making our stay memorable. Thank you! We're glad that you had a wonderful stay! Have stayed at Deer Park numerous times over the years and have never been disappointed. Ammenities are great, condos are lovely - first class all the way. Great weekend. Would stay at 205 again! We're happy that you had a great stay! Great to hear! We look forward to seeing you again! We stayed 5 nights for a New Years ski vacation and loved every minute of it. Our 2 BR unit was clean and beautiful and had a lovely view of the river and a great fireplace. The location was perfect for skiing as Loon was only 5 minutes away and the other areas were within an hours drive. Would go back again in a heartbeat. The home was very clean and it was very nice! I have used Loon Reservation Service many times in the past. The condo unti we stayed in was great, very clean and all the amenities of home. The reservation desk is very easy to work with. I would highly recommend Loon Reservations and am planning on using them again. This property is ideal for a family holiday in this area. the condo was spotless, very comfortable and of a high quality. I would recommend it to families and couples. Everything you could possibily need was providedin the Condo. We had a wonderful and relaxing stay. Except for a couple of spiders, the house was perfect. In a perfect location, easy to find, lovely scenery, peaceful. We were dissapointed that the hot tub by the pool was cold. Other than that we enjoyed our stay and will definitly stay again in the future. Pristine To Say The Least ! This condo was lovely and spotless. Couldn't have asked for a better location - beautiful view of the river and very quiet location. We loved this unit and will definitely return next year. Thank you. What a great place to stay we will be back. We all had a great time! We found the condo very acomedating. The kithcen,s set up was spacious for preparing meals and dining. Bedrooms were clean and sunny. There were a lot of family activities in the resort compound, including biking, swimming indoors and swimming in the "lake". Price was very reasonable. check in and check out was no hastle. I would definitely recommend this resort for families. Very pleasant stay. Quiet. Would definately stay there again. We loved Deer Park 205 and look forward to staying there again in the future. The deck overlooking the river was a great place to relax and unwind after each day. The whirlpool tub for 2 in the master bath was a huge selling point for us. Also, the sandy beach at Deer Park is a great way to have fun with little kids. It was a vacation we'll never forget! We chose to stay at unit 205 in Deer Park because of the air conditioners in both bedrooms. Boy were we glad we did, because we were lucky enough to be in NH during a heat wave. It didn't even cool down at night. The a/c was the type where you have a hose through the window, but it worked very well. 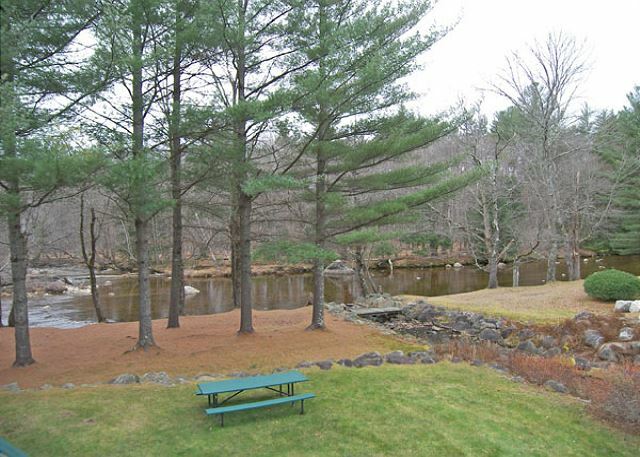 The Pemi river runs in the back yard of this unit - beautiful, and so much fun for our boys. The place was well-equipped and really clean. Would definately recommend to a friend. Incredible stay at deer Park 205!!!!! Deer Park is a wonderful place to stay! This was our second time at 205. We plan on always staying here when we visit the area. The condo has everything that you need for your stay!! We enjoyed our time out on the deck and appreciated all of the furniture. Deer Park 205 is very clean and a nice environment to mak family memories to last a lifetime!!!! Jeffrey A from Worcester, MA does not recommend this vacation rental. Deer Park is an excellent development, but this unit was not one of the best we've stayed in. The heater in the kitchen area made an irritating clicking noise. Also, early on several of us were sneezing, and we suspect someone has had a cat in there. But otherwise the unit is fine, a great view of the river from there. Our family really enjoyed our stay. The flat screen TV made it modern. The fireplace really made it comfortable and very relaxing after a long day of skiing. Our family truly enjoyed our stay. Martin G from Concord, NH does not recommend this vacation rental. This condo (Deer Park 205) was wonderful...until we needed to use hot water. All four of the guests experienced a serious shortage of hot water during a bath or shower...most pronounced when trying the hot tub. This lack rendered the hot tub completely worthless. This our first trip as a combined family, so it was my fiance, my son (age 15), my son's little brother (age 4) and myself. So needless to say I was a little nervous, but as soon as we got off the highway and saw the huge mountain view in front of us we knew everything was going to be ok. When we walked into the condo we were so happy to see how clean it was and had that "just like home" feeling to it. Also there was just so many things to do with the kids (all age ranges). We were totally happy with our vacation and are planning an adult trip in the Fall. Beautifully furnished, wonderfully maintained condo. I look forward to a return visit. The condo was beautiful, clean, good location! It was an expensive 2 day get-a-way though, ski prices, rental prices really add up. The view of the river from the balcony was stunning. The jacuzzi for two in the master bedroom was a wonderful treat! The property was very spacious and tastefully decorated. Unfortunately, while we didn't expect daily maid service, we were surprised to be given one set of towels for a week's stay. When we asked about it, we were told that we should do the laundry daily, something we found unreasonable, especially when it should be so easy to give some extra sets of towels (and pillows) to bring it up to standard with the rest of the otherwise wonderful property. Good time had by all! See you next year. This was the ideal base for a 3 day getaway to do some day hikes in the White Mountains. We thoroughly enjoyed the Deer Park complex and the condo met all our expectations. We look forward to coming again during the ski season and hope to stay at the same place. We were pleasantly surprised to find two new portable air conditioners in the condo. In July you need them! The rooms were nicer than the photograph s. The bubling stream, and constant flowing river within 50 feet were great. It seemed to be a fairly busy time when we were up there, at least at this particular building. Sounds from the above unit, and side units and below units were very audible. If you wanted peace and quiet, this IS NOT the unit I would rent. The pool seemed to close at a fairly early time, especially for a holiday weekend which was disappointing.